The species is distributed in Greece, Turkey, Caucasus, Iran, Iraq, Syria, Kopet Dagh, and Kurdistan. There are some discussions about the taxonomic status of the species, as some authors consider it as a subspecies of Hipparchia semele (Linnaeus, 1958). Otherwise, Armenia is inhabited by nominate subspecies, which has relatively wide distribution in deciduous forests and juniper woodlands of the country. The elevation range occupied by the species is between 1000 and 2200 m a.s.l. According to observations the females lay down eggs on various Gramineae, therefore probably there are various grasses used as host-plants. The species is slightly uncommon within typical habitat, however it shows rather stable population trend during 2003-2013 (p>0.05), although it is noted that their density is lower in the areas with less shade, e.g. in intensively logged forests. The species is not included in the Global and National Red Lists, but is included in European Red Book as Least Concern. 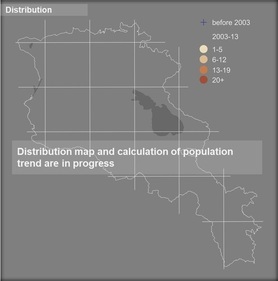 Preliminary assessment of the conservation status of Anatolian Grayling for Armenia also suggests Least Concern, however taking some sensitivity of the species into consideration, it should be noted that the population trend could change with intensification of logging practices and therefore be better visible on longer periods of time. At current the distribution of Anatolian Grayling is partly covered by Protected Areas and Emerald Sites, also the species is presented in Gudemnis, Lichk, Kaladash, Gyumorats, Kajaran, and Gnisheek Prime Butterfly Areas.At current there is no necessity for special conservation measures, rather than monitoring of the species population aimed at early determination of population decline and development of appropriate response measures.